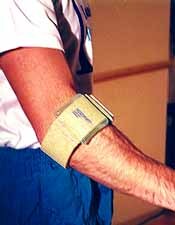 Note: A tennis elbow strap should only be used during periods of activity! The Aircast Pneumatic Armbands applies 50% more pressure to the involved area than conventional tennis elbow braces, while at the same time the plush foam padding makes the Aircast more comfortable. This keeps the forearm extensors from exerting excessive pressure on the tender tendon insertions to the bone where the pain originates. Aircast Air-Stirrup Ankle Brace - Suitable at some stage for virtually every ankle injury. Dynaflex Pro Plus and Dynaflex Pro | Amazing Therapeutic Wrist Gyro - Dynaflex Pro Plus, originally known as Dynabee is a hand-held gyro-scope for challenging exercise or treatment of pain in the wrist and forearm.